The Commission on the Future of the United States Aerospace Industry hired Content First to prepare a detailed report on the economic importance of the aerospace and aviation industry to the U.S. economy. 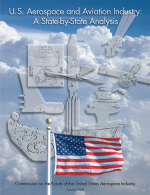 The Commission on the Future of the United States Aerospace Industry used this groundbreaking report to make a compelling case to congressional lawmakers at a public event on Capitol Hill on the importance of the aerospace and aviation industry to the U.S. economy. Furthermore, the findings in this report were included in a final report presented to the President of the United States and to the U.S. Congress. This example illustrates how Content First produced a comprehensive industry report for our client in a format that made it accessible to all. The Commission on the Future of the United States Aerospace Industry used the report to understand the economic impact of the aerospace and aviation industry natinally and on all 50 states, the District of Columbia, and Puerto Rico. The Commission used the report in executive branch policy briefings, congressional meetings, presentations to local communities, and educating the media.